Average 4.39/5 out of 23 total votes. JASON AARON & MIKE DEL MUNDO TAKE THE PRINCE OF ASGARD IN A WHOLE NEW DIRECTION! 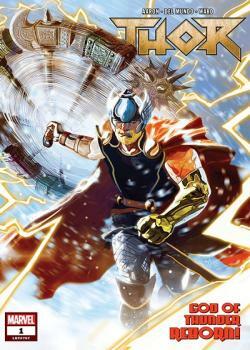 Thor Odinson has regained his mantle – and with it, a wild new world of trouble on his mighty hands! The artifacts of Asgard have been scattered across the earth, and to reclaim them, Thor will have to face some ugly truths. Like the production cost of hundreds of new hammers! And the Thunder God is going to need every last one of them if he’s going to stop the unstoppable Juggernaut. Jason Aaron takes the Prince of Asgard in a whole new direction with YOUNG GUN artist Mike Del Mundo joining him at the helm! And don’t miss the latest chapter of the King Thor saga with acclaimed BLACK BOLT artist Christian Ward, as the Thor of the far future encounters an old friend who’s undergone some startling changes.